These are very high quality velcro ties in multiple colors and multiple sizes, Incredibly useful item!!! If your wires are crazy like mine these colorful velcro ties are perfect to organize them and minimize the amount of space they take take up. The colors are not only pretty, they also let me set up a system for color coding my wires so that I can easily identify them later when I need to. 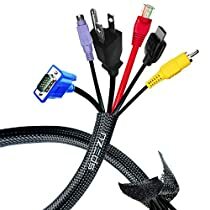 I am excited about getting my computer wires organized with these but they will be great for so many other things too!! A seamstress can use them to organize rolls of fabric remnants. They would be great for yarn, string, rope, wire, all kind of craft materials like that. I usually tie those off things off with a little bit of yarn or string but that is bad about getting tangled or knotted and being hard to start back up after being put away for a while. This wouldn't do that! 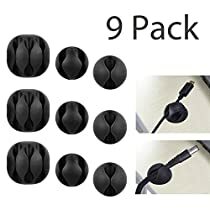 Omgoodness these would be great to have for every single corded small appliance in the house so that cords are never messy again. I think I just realized I have to order more of these right away!! Can you imagine how much better these would be than anything else like twisty ties or rubber bands? They would be great to keep in the kitchen, bathroom, office . I have put several of these aside to secure unfinished rolls of Holiday wrapping paper. I usually put a little bit of tape at the the end to keep the roll from unraveling but that never holds well and when it comes off it ruins the paper it was stuck to. 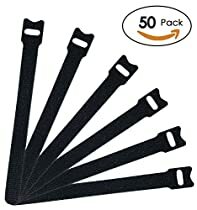 These Reusable Velcro Cable Ties are made from high quality material that should last a very long time. The velcro works very well and locks tight. I just love that they are different colors and I LOVE the colors. The pink,blue, and green ones are neon :) - awesome!! These also come in multiple sizes: 3 Ties = 10" x 0.8", 7 Ties = 6" x 0.6", 10 Ties = 5" x 0.5". I highly recommend LOTS of these lol :). Sample provided for an unbiased and completely honest review. Thank you so much for giving me the opportunity to review such a high quality product!! I'm a big fan of both technology and efficient aesthetics, which sometimes clash when you end up with a ton of cables everywhere at home, work, or even in your car. This multi-pack of cable clips work GREAT to mitigate that! Provided here there is an even amount of single, double, and triple clips were included (3 of each), all with the same ACRYLIC ADHESIVE which reminds me of the one used on easily-movable windshield car mounts nowadays. The claim that they are not as damaging or hard to remove is mostly accurate too, which I'm a big fan of since I hate adhesive residue. The only downside of this product that I can think of is that the AMOUNT of DOUBLE/TRIPLE CLIPS seems IMPRACTICAL since I could use far more single clips and I could use double clips, and even more compared to triple clips. For me, I would have traded 1-2 triple clips and 1 double clip for more single clips. Additionally, I really wish it was more clearly mentioned that the acrylic is removable on most NON-POROUS SURFACES, ie NOT WALLS/PAINT. I stuck some to a nightstand and others in our cars and desk, but the one I placed on a painted wall feels like it will NEVER COME OFF without ripping paint/dry-wall off (I tried). Still, very solid product, just make sure you don't place it on WALLS/PAINT. For reference, I mostly tried these out with laptop charger cables, USB-C cables, microUSB cables, and Quick/Dash/Fast USB charge cables. Review disclosure: Similar to Amazon's Vine program, I was provided a sample of this product at a discount for the purpose of examination and review. No review or particular rating was promised in return, and the opinions expressed here are my own following my first-hand experience with the product. These came packaged in professionally printed packaging and were easy to open. It's the easy open clamshell that takes minimal effort to remove. The clips themselves feel rubbery and are pretty flexible so it would be easy to fit oversized cables and not just standard cell phone cables. The sticker on the back came off easily and the adhesive is pretty secure. It isn't permanently secure, it takes medium effort to remove the clip once placed. If you want a more permanent adhesion additional adhesive would be required. The adhesive isn't all that strong, so if you place this on a vertical surface or even upside down they may not hold very well for a long period of time. If you have it on the desk top with gravity working for it you shouldn't have any problem. If you want to secure it vertically or upside down you will have to add more adhesive. I am impressed with this pack of nine cable clips and that they give you a mix of triple, double, and single channel clips. The only problem I have with these clips is I never seem to have enough of them. I received this product at a discount in exchange for my unbiased opinion.